There's a new American Girl doll, and she's from . . .
. . . the War of 1812? Apparently, her father owns a shipyard on Lake Ontario and there will be some Great Lakes naval battles in her books. Which is kind of awesome? And unexpected. Look, I know there are a lot of problems with the American Girl dolls and their stories. They argue that childhood is ahistorical, with the same storylines iterated with minimal alterations for girls living in four different centuries. But I also loved those dolls and read every one of their books 100 times when I was in elementary school. Anything that gets girls interested in history is a good starting point, even if it is pretty bad history in the long run. At the very least, they're better than the Elsie Dinsmore dolls and books. 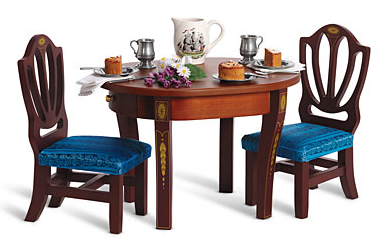 And there is also the small matter of my now being able to purchase these teeny shield back chairs and federal-style table. Well played, Pleasant Company. Well played. 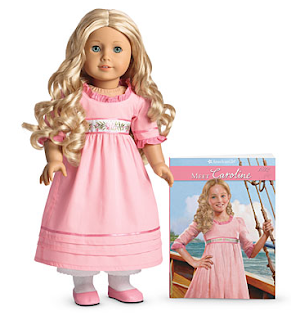 The Pleasant Company should have bit the bullet and called this one a Canadian Girl doll. Much more market interest. One of her outfits has a spencer! Be still my regency heart!